Disposable Plastic Wear is a new division of Champaign Plastics. Champaign Plastics is your source for disposable plastic wear and personal protective equipment that includes aprons, banquet rolls, beard covers, bibs, coats, gowns, face masks, shower caps, shoe covers, sleeves, and more. Go ahead and take a look at our products using the links on the left. Personal Protective Equipment (PPE) helps keep you out of danger. Plastic gloves, sleeves, aprons, and face masks protect us from bacteria and other dangerous materials. At the same time, these products and others, such as shoe and boot coverings, beard restraints, and hairnets, prevent us from contaminating sterile fields and food substances. In addition, certain plastic products keep us clean. Paper Soda Jerk Cap: unisize; Space theme on one side and Sea theme on the other. Set of crayons available with purchase. 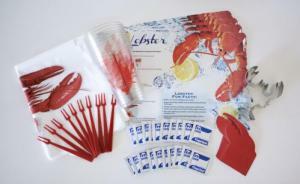 Lobster Party Set; Pack includes 10 each of: paper placemats 10" x 14", plastic bibs 15.5" x 20", red plastic picks 5.5", plastic cups 16oz, place cards 4" x 2.5", 20 moist towelettes 5" x 7", and one metal cookie cutter 6". 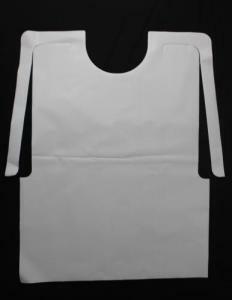 Plain white adult bibs with no crumb catcher. 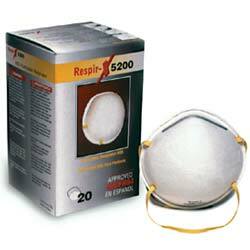 Disposable Plastic Wear - This store is powered by ShopSite web catalog software.